Potato (87%), John Boston Craft Beer Batter (7%) (Wheat Flour, Wheat Starch, Natural Flavouring (Wheat), Salt, Raising Agents (450, 500), Wheat Gluten, John Boston Pale Ale Beer (Barley)), Canola Oil. Preheat oven and oven tray to 210°C fan forced for 10 minutes. 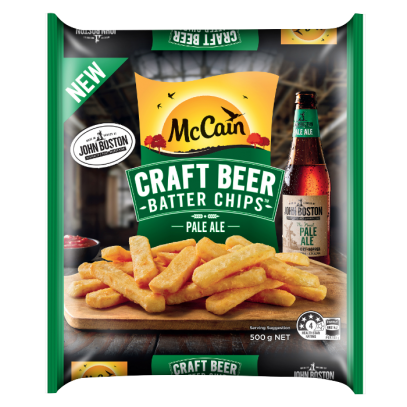 Spread McCain John Boston Craft Beer Chips in a single layer, on the middle shelf. Bake in oven for 10 minutes, turn and cook for a further 8 – 10 minutes until crisp and golden.